Starrett is in his mid forties, dresses well, likes a pint of Guinness and is a decade into his third career. The locals say he may have a sixth sense: he's not so sure but has been eternally grateful when that special something or other has kept him out of trouble and come to his aid while on a few cases. A lone building on a small Island off Ireland's Donegal coast. St Ernan's is politely known as a "retirement home" for priests. The exiled residents are guilty of such serious offenses as entrepreneurship, criticising the church, or getting too friendly with the flock. Things take a turn when Fr. Matthew McKaye is found dead in the kitchen, a pot of potatoes still boiling on the cooker top. Has one of these outcast priests committed murder. There are no apparent outward signs for the young Fr, McKaye's demise. The case is assigned to Inspector Starrett and his tenacious team of the Ramelton-based Serious Crimes Unit who discover that the unexplained cause of death to be the first of a strong of oddities. Starrett soon discovers than ten clergy alone on an island can concoct a great deal of mischief, but what could the young priest have done to get himself murdered? Long-buried grievances are awaken by the ghosts of Starrett's seminarian past, and thought Starrett excels at untangling facts from speculation, this investigation is going to require all the procedural discipline he can muster. In ones and twos the Sweeney clan and their partners, wives and children gather at Liam Sweeney's farm on the outskirts of Ramelton, Country Donegal to celebrate Liam's birthday. The banter and storytelling is great as they wait the arrival of the single missing family member. But when Inspector Starrett unexpectedly arrives at the farm it becomes clear that all is not well. The body of a Sweeney family member has just been discovered in the courtyard of a waterfront warehouse in the nearby town and circumstances are suspicious to say the least. In the course of the investigation Starrett begins to realise how weird and wonderful the politics of a family are as he discovers that of the several suspects he and his young team throw up, two, or maybe even three, of them are family members. On top of which, it appears to Starrett's team that every family member has a secret or two they'd like to keep hidden. But while working on this investigation Starrett discovers some dramatic news which concerns his own family. The bloodied body of a crucified man is discovered in the Second Federation Church in the Donegal Heritage Town of Ramelton on the first Friday of summer. The investigations by Inspector Starrett and his young team of the Serious Crime Unit soon reveals a Country Donegal that is ot nearly as righteous as its many churches might suggest. The body is that of local master carpenter James Moore, who Starrett discovers was having a relationship with the wife of the pastor of the very same Second Federation Church, and she has mysteriously disappeared. Meanwhile, it transpires that Moore's own wife has started to get close to her childhood sweetheart. While investigating Moore's past Starrett also discovers that the carpenter might have witnessed a local professional villain in action. "From its killer first line to its last, The Dust of Death is compelling and elegant; like a well-woven garrotte." "A mystery that's as smooth a good single malt and none the less satisfying." 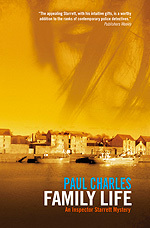 "Charles is already known for his DI Christy Kennedy novels and his new hero, Inspector Starrett, is like Kennedy in that, unusually for crime fiction, he is not a tortured, dysfunctional soul of a loner who breaks the rules to see that justice is done, but an ordinary, pleasant and likeable individual. This does not mean that the novel is not hard hitting and gritty. Fan of the genre will not be displeased as Starrett and his team investigate the death by crucifixion in the sleepy town of Ramelton where all is not as it seems." "A cracking good read ... a classic crime novel." "The appealing Starrett with his intuitive gifts, is a worthy addition to the ranks of contemporary police detectives." "Smoothly crafted... An improbable hero in an improbable setting, trying to solve an improbable murder, a crucifixion. Yet it is to Charles' great credit that he pulls it off, speeding the reader along with a red herring or three and a romantic sub-plot that holds our interest until the end." "I suspect that Starrett and co[mpany] may pick up quite a following after this quirky, individual opening." "The Dust of Death is engaging and satisfying. When a man so obviously enjoys writing his novels, it is difficult not to find them enjoyable to read." "Paul Charles is incredibly adept at painting a large cast of three dimensional characters. We see all kinds in this novel, from the morally conservative to the ethically questionable, each one painted in exquisite detail." "Charles begins this new police procedural series with all the mastery of his craft." "Like Charles' other creation, DI Christy Kennedy, Starrett is a brilliant character." "This is a page-turner: you actually want to know who did it and why." "Starrett is not a character anyone is like to forget soon." "Small-town stories featuring crimes of a more personal nature and starring an unassuming, methodical protagonist. . . Charles is a fine storyteller, and this shapes up to be a fine series, different in tone from the Kennedy novels but equally involving." 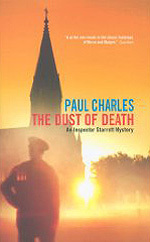 "Paul Charles is a brilliant storyteller, and Inspector Starrett is a gem of a character." "In Irish author Charles's third Inspector Starrett mystery, Starrett investigates a murder at a home for wayward Catholic priests... The various secrets uncovered are worth waiting for." "Charles makes Starrett's third case leisurely, literate, ingenious... and as old fashioned as the idea that priests are the pillars of private morality." "The reader of St Ernan's Blues will learn a lot about the priests of St Ernan's and a lot about human nature." "Starrett and his girlfriend are both likeable and smart. I was rooting for them to stay together. I am guessing the next Starrett novel may throw some hurdles their way and it will be worth discovering how they overcome these." 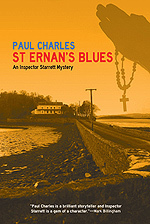 "Fans of locked room or closed community mysteries will find much to enjoy in St Ernan's Blues. While there is some backstory explored, new readers of the series can easily follow the threads here and will be inspired to explore other books in this series by Paul Charles." "An unusually intriguing mystery novel." "(You're) led a merry song and dance very beautifully... There's a beautiful love story at the centre of this and the character Maggie (Keane) I really love." "With each of his novels, Charles tries to unpick the central mystery that unites all crime writing: what drives a rational person to commit the ultimate crime of taking a human life. He doesn't aim to make the killer sympathetic, but to present their actions as rational from their perspective." "Some lovely gentle humour peppers the pages of St Ernan's (Blues). Starrett's cheerfulness and optimism are unusual for a modern-day copper; neither is unwelcome or out of place. This is an amiable novel with a droll appealing cast of characters."